The Byron Bay Writers Festival, which started in 1997, has grown from just 200 locals in attendance, to an event selling 45,000 tickets. The focus is on Australian writing, with some Indonesian and Asian authors included. The Byron Writers Festival, a three-day event, includes everything from workshops, meet the author events, lunch time talks and literary dinners. If you plan to head to Byron Bay for this excellent annual event, you should get your day passes or individual events that interest you as soon as possible—for example, the literary dinners are very popular and two are already sold out. $40 for a youth pass (good for Sunday only). Featured events for the Byron Bay Writers Festival 2015 might carry a different price, such as dinners, which run $95, or “Liner Notes: Fleetwood Mac’s ‘Rumours’” on Saturday, which costs $50. Make sure to book your accommodation for the event as well since with so many people coming from all over Australia it will be at a premium. Consider staying a little off the beaten path where you can relax each evening after a day at the festival. Broken Head Holiday Park, just 7km south of Byron Bay, provides a peaceful, beachside home base for your stay during the Byron Bay Writers Festival 2015. The writers festival, situated at North Byron Events, will feature seven marquees where guests will find a variety of conversations, panels, readings, lectures and book launches happening throughout each day. The three days—Friday, Saturday, Sunday—all begin at 9 am and end at 5 pm with special events happening in the evenings on Friday and Saturday. A Wednesday night event kicks off the festival with Gasp from The Guardian’s cartoon First Dog on the Moon. Most sessions will run about an hour in length during the day, and the Byron Writers Festival is a relaxed environment where you are allowed, and even encouraged, to wander between marquees to see what interests you. If your favourite author is speaking, then make sure to nab a seat early. As a bonus, most authors will head to the festival bookshop after their sessions, so head over to there to get a copy of your book signed by the author. Mary Ryan’s will run the bookstore tent and the author signings will take place adjacent to the tent after each session. On Sunday as part of the Byron Bay Writers Festival program, one of the marquees will feature children’s authors and give kids the chance to meet some of their favourite authors. Beyond the marquee sessions, there are special events that might appeal to visitors as well. The Byron Bay Writers Festival program includes such fun special one-offs as the literary food events (two of which are sold out! ), Friday night shows such as “The Cowgirl and The Showgirl” and late afternoon to meet children’s author Jacqueline Harvey. Saturday night features a talk by Kate Grenville, a discussion about Australia’s history of protest, a poetry slam and more. The site for the Byron Bay Writers Festival 2015 is at the end of Bayshore Drive in the Arts & Industrial Estate. Just a warning, though, if you’re driving, on-site car parking will be limited. If you want to park at the festival, then arrive early. There is a $5 fee for daily parking. A shuttle bus service from Byron Bay’s town centre will be available throughout the Byron Bay Writers Festival 2015. It will run from 8:30 am to 6 pm, Friday through Sunday and cost $5 per person, per ride. The shuttle will be on a 30-minute cycle. As for food at the event, there will be local coffee and food vendors. However, the festival does not forbid outside food, so you’re welcome to bring a picnic to enjoy on the grounds in between sessions. 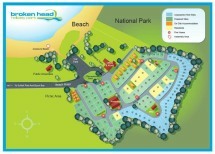 With several options for Byron Bay accommodation from powered campsites to beach shacks, Broken Head Holiday Park makes a great option for a place to stay during the Byron Writers Festival. The location is ideal—just a quick drive into Byron Bay where you could easily park and take the shuttle to the festival. Plus, with its affordable prices, you can plan to stay a little longer to take advantage of all Byron Bay offers its visitors – check out our blog for ideas!